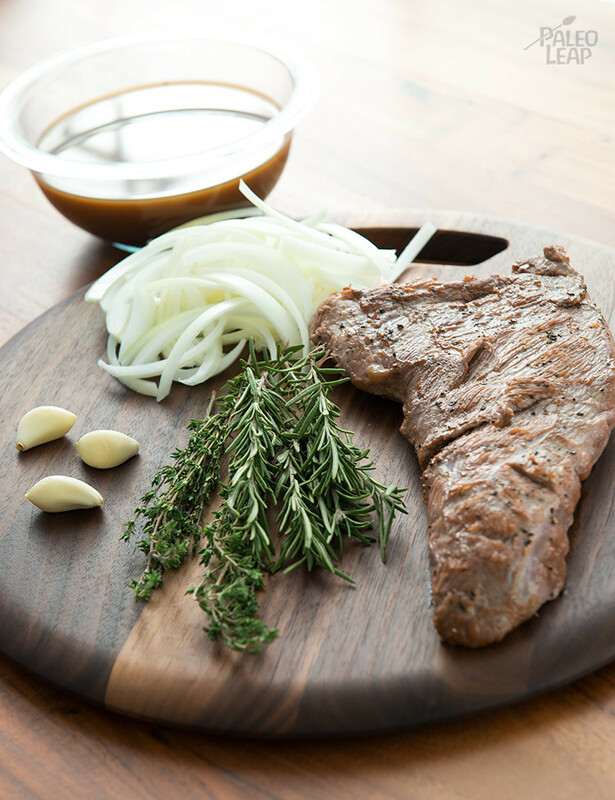 We’re excited to bring you a recipe that will be featured in one of ButcherBox‘s kits. ButcherBox is making grass-fed meat more accessible by delivering a curated box to your door each month. Each box includes a variety of beef cuts enough for 15-20 meals, all 100% grass-fed! Their kits also include recipes that pair with the cuts included in your box so you can be inspired by new flavors and techniques. We’re lucky enough to have 2 of our recipes featured in their upcoming boxes, our spicy cranberry meatballs and this French Dip inspired recipe. The traditional French Dip is best known as a sandwich of thinly sliced beef served on a French baguette and a jus to the side. Despite the name, the classic “French Dip” has nothing to do with France. It was actually created in Los Angeles in the early 1900’s. Two restaurants claim they each invented the dish within a decade of each other and both take credit for the variety of stories of how the actual sandwich came about. Those stories often include a fireman or policeman and a server who accidentally dropped the bread into a pan of meat drippings, or a patron complaining of sore gums or stale bread. We’ll never know the truth, but we’re happy to give credit to either place and either story. Here we remove the sandwich component completely and just serve the beef with the jus. Of course you could always wrap it up with lettuce, or serve it on your favorite version of a Paleo bun, but we think it is just as tasty without. Since you don’t have the bun to soak up all of the jus, we thickened it slightly to help the flavors hold on to the meat. We also took some liberty with the many different versions you find across America and added onions. We think the flavor combination with the herbs and onions puts this dish over the top. To add an extra kick, serve some prepared horseradish on the side. Or if you tolerate dairy, use your oven broiler to melt a little bit of provolone cheese over top the beef. Sliced, or shredded, Paleo bun or no bun, this French Dip is simple and satisfying. SERVES: 2 PREP: 15 min. COOK: 4h. + 10 min. Reserve 1 tbsp. beef stock and store in the refrigerator for later use. In a mixing bowl, combine the garlic, beef stock, Worcestershire sauce, coconut aminos, rosemary, and thyme. Season tri-tip with salt and pepper all over. Heat the cooking fat in a large skillet over medium-high heat. Once the skillet is hot, sear the tri-tip on all sides until fully browned. About 1-2 minutes on each side should be good. Place the onions at the bottom of your slow cooker, then place the tri-tip on top. Cover with the beef stock mixture and add the bay leaf. When done cooking, remove the beef and place on a platter. Strain the remaining juice into a sauce pan to separate the onions. Reserve the onions to serve with the final dish. Heat the sauce pan with the juice over medium heat until boiling. Meanwhile, mix together the reserved tablespoon of beef stock and the tapioca flour in a small bowl until the tapioca flour is dissolved. Once boiling add the stock and tapioca mixture and whisk constantly until the sauce has thickened slightly. 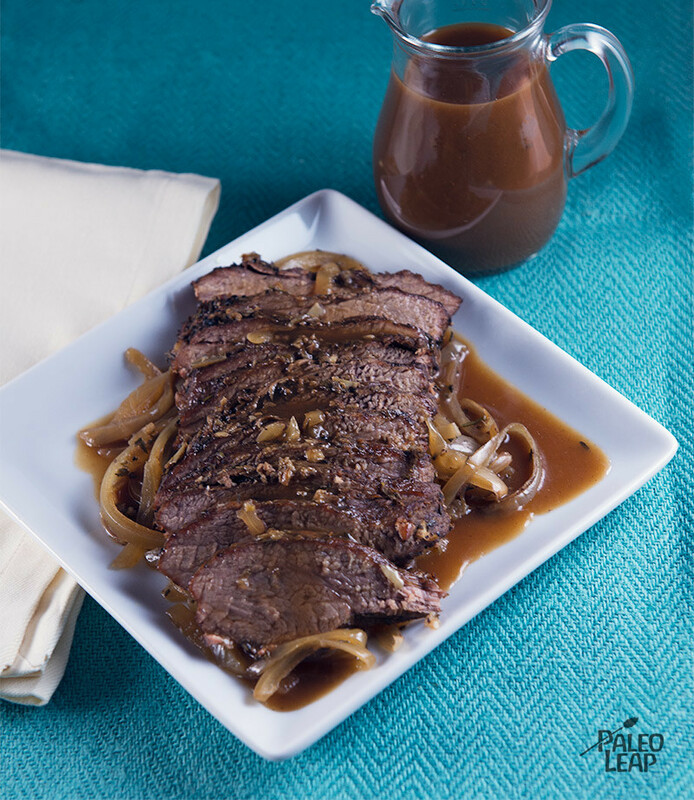 Slice or shred the beef to your liking and place over the onions, serve with the beef au jus. Add some horseradish atop the beef to add a nice zing if you desire. Affiliate Disclosure: Paleo Leap is an affiliate of ButcherBox and may receive a commission from the sales generated from the link in this post.